National Marriage Week is coming up, Feb. 7-14. If you are married, why not use this week to make a case to your unmarried friends - particularly those who are cohabiting - to consider taking the Big Step? In 2018 8.5 million couples were cohabiting, but only 2.3 million couples married. In fact, there were more marriages in 1970 than in 2015! The number of never-married Americans nearly quintupled from 8.7 million in 1970 to 41.3 million never-married in 2015. Perhaps the never-married do not know the benefits of marriage. According to a new study of more than 20,000 people over age 60 in England and the U.S. by researchers at University College London, married cancer patients are more likely to survive illness than those who are single. In fact, those who are married are two-thirds less likely to have a heart attack! A second major value of marriage is that married couples are much less likely to engage in risky behavior, such as substance abuse and dangerous driving. Why? "Married people are more aware that they have somebody who depends on them, and therefore they make the conscious decision to put self-preservation above all else." Third, married men are two-thirds (64%) less likely to have a fatal stroke than single men," according to the American Stroke Association. However, the study conducted by Uro Goldbourt of Tel Aviv University, men who are unhappy in their marriage, experienced a less significant advantage than those with successful marriages. Fourth, those who marry are less likely to feel "overly stressed or depressed," according to the University of Chicago. Dario Maestripieri, a University of Chicago professor, asserted, "What we found is that marriage has a dampening effect on cortisol responses to psychological stress, and can therefore act as a buffer against stress." Fifth, there is a higher chance of recovering from major surgery if one is married. "Happily wedded patients who undergo major surgery are more than three times as likely to still be alive 15 years later when compared to their unmarried counterparts," reports Kathleen King, a researcher at the University of Rochester. Why? Ms. King asserts, "There is something in a good relationship that helps people stay on track. In fact, the effect of marital satisfaction is every bit as important to survival after bypass surgery as more traditional risk factors like tobacco use, obesity, and high blood pressure." Sixth, married couples have a much lower chance of developing mental illness, according to a 1991 American study. Social psychiatrists Lee Roberts and Darrel Regier published a paper showing how "married people have significantly lower rates of severe depression and at least half the likelihood of developing any other major recognized psychiatric disorder than never-married, cohabiting or divorced people." Seventh, if your marriage is a happy one, you sleep better than your dissatisfied or single counterparts. Wendy Troxel, a psychologist at the University of Pittsburgh, reports that women are "particularly boosted by marriage." For example, she reported that married women are found to have a 10% better chance of getting a good night's sleep than unmarried women. She reported that "Marriage can be good for your sleep if it's a happy one. But, being in an unhappy marriage can be a risk factor for sleep disturbance. If you're not sleeping, you're more irritable, and have lower frustration and tolerance levels" that can "affect your marriage." Eighth, and most important, research has continuously shown that by jumping the broom, you are effectively adding a couple of extra years to your life, and, in some instances, up to ten more years! Dr. Ilene Siegler and her research team at the Duke University Medical Center studied 5,000 individuals born in the 1940s, who observed how stability and change in the patterns of midlife marital status affected health risks. They discovered that "having a partner through middle and old age is protective against premature death., Those who never married were more than twice as likely to die early than those who had experienced a long, stable marriage throughout the majority of their adult life." What's more, couples can take steps to deepen their relationship and extend their lives. Dr. Sue Johnson developed what she calls a "Hold Me Tight" relationship education. It is a new approach to helping couples foster trust and connection. The Hold Me Tight program improves relationship satisfaction, trust and intimacy by helping couples develop secure attachments with their partners. Marriage not only increases the odds of a long life, but a more satisfying one. 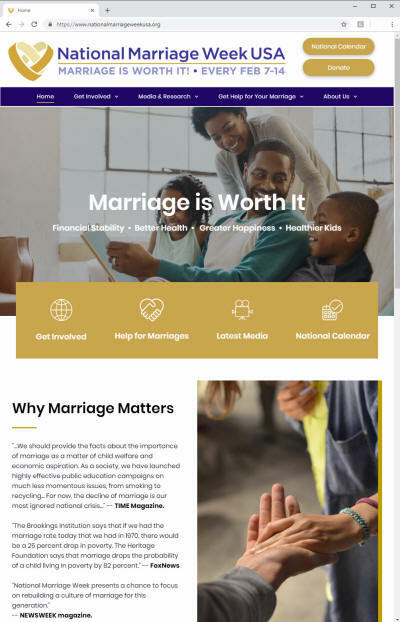 Visit https://www.nationalmarriageweekusa.org for more information.